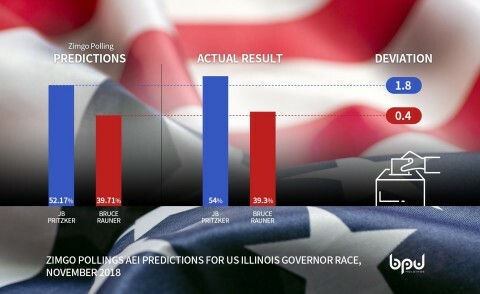 CHICAGO--(BUSINESS WIRE)--ZimGo Polling, BPU International’s artificial emotional intelligence political forecasting tool, accurately predicted the outcome of this month’s Illinois governor race. Omitting outdated efforts with the telephone or other intrusive methods, ZimGo Polling impressed its audience on November 5th by reporting Pritzker would win with 52 percent of the vote vs. Rauner’s 39 percent. These were close calls that were within two percent of actual results. Able to update hourly, ZimGo Polling has been tracking both candidates since April. The product’s method is achieved by accurately assessing emotional citizen sentiment sifting through the half billion daily tweets and other public forums. By comparison, other methods used by established pollsters went through time intensive efforts that are surpassed by ZimGo Polling. (NBC 8/16 46% Pritzker/30% Rauner; WeAskAmerica 6/11 36% Pritzker/27% Rauner [source: RealClear Politics]). Other platforms perform Syntax Analysis with one sentence at a time, BPU’s AEI scores entire paragraphs, including emoticons. Competitively, BPU can interpret slang using configurable dictionaries. AEI provides Entity Recognition analysis, for people or organizations, over time by person, brand or entity. This extends the tool’s value to multiple industries needing accurate feedback. BPU Holdings is dedicated to generating the most advanced, usable, secure and innovative Artificial Emotional Intelligence (AEI) technology in the world. Artificial Intelligence (AI) emulates how people think — AEI emulates how people feel. Information about BPU is available by contacting press[at]bpuholdings.com. Sales inquiries to our Las Vegas, Nevada, office may be made to (702) 824-9717 or toll-free: (866) 851-6832.